No doubt from reading the title, some of you are thinking, "Wait, you've already reviewed this one!" Well, I assure you I'm not that forgetful, and as it turns out, good things come in twos. 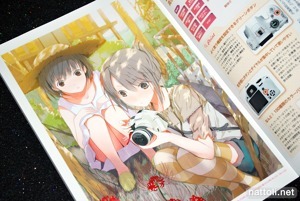 Girls With Cameras/A Pictorial Book is the second art book to come out on the cameras theme this year. And though it's a hard fought battle, I think this new Megami Magazine production is the better of the two pictorial books. While both books include excellent artists, it's easy to see that Megami Magazine has a stronger pull when attracting more of the big name artists to participate. 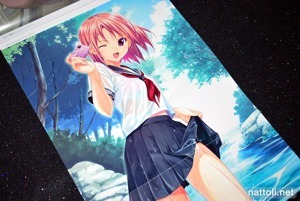 Redjuice, Takamichi, and Koutaro each contributed a poster to the pictorial collection and there was a poster version of the cover art by Hanuharu Naruko as well. 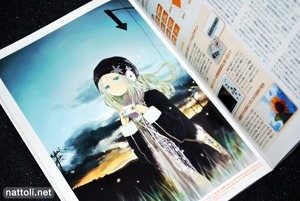 Only the illustration by Takamichi was repeated on the inside. 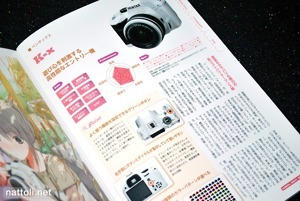 Girls With Cameras/A Pictorial Book is B5-sized and 112-pages. 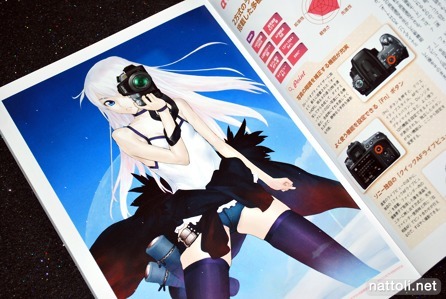 Much like with the Digital Camera Girl Famous Views Art Book each illustration is placed next to a page of camera information. 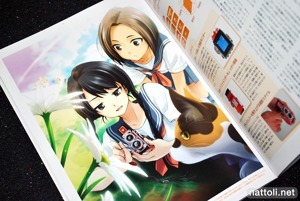 The camera information is a lot more detailed in Girls With Cameras/A Pictorial Book with photos of the cameras, along with front and back views showing settings and functions available. The above illustration is by Fuyuno Haruaki. 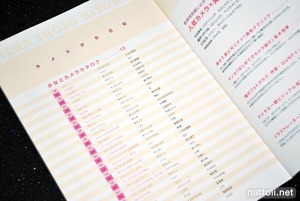 As I mentioned before, this collection showcases a great collection of names. Pictured above from left to right are KEI, Minamura Halki, Noriyuki Matsumoto, refeia, Kouji Ogata, and John Hathway. One thing that stood out in Girls With Cameras/A Pictorial Book was the emphasis on illustrating the camera and all its details, which was sometimes glossed over in the other book with faraway scenes. Though I'm not a fan of John Hathway's character designs, his illustration is beautifully detailed in every aspect from the dress, to the background, and the camera. I'm really quite partial to Ugetsu Hakua's illustrations, so I was thrilled to see his work included, especially because he rarely participates in this kind of compilation book. And Midori Foo, whose art work graced both Moeru Japanese Sword Girls and Headphone Girls A Pictorial Book, delivers another stunner in this camera collection. The artists pictured above from left to right are Nilitsu, Haru, Shunsuke Taue, Juu Ayakura, Takigawa Yuu, and Hiiro Yuki. I was really a fan of just about every picture in here, but Shunsuke Taue's really stood out with a beautifully detailed underwater scene. 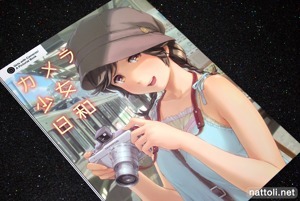 It was also unexpected to see one from Takigawa Yuu, another artist who doesn't usually participate in these kinds of books. 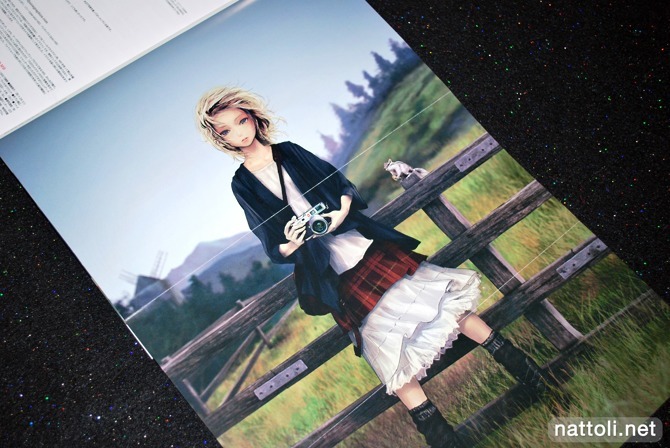 Surprisingly, there were a few artists who had an illustration in both Digital Camera Girl Famous Views and Girls With Cameras/A Pictorial Book. The overlapping artists I noticed were Tokiame, Takamichi (who had the cover of the other one along with a poster in this one), and Nanakusa (whose illustration for both had a similarly styled girl). 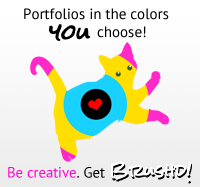 In total, there are 39 artists participating. Before the end of the color section of the book, there are six pages with quick tutorials about taking photos in different settings and adjusting for light accordingly. It even touches on photographing cosplayers and figures. The color pages end on page 93, with the monochrome pages featuring a short comic along with some picturing taking techniques and the index. And with that, Girls With Cameras/A Pictorial Book ends up being another enjoyable pictorial book with an impressive selection of artists that really does mangage to stand out in a crowd. Mhh, both books look good but do think I might look out for this "Girls With Cameras/A Pictorial Book" instead. 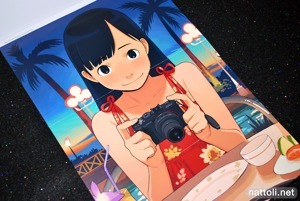 I just want to know the artist's name for the first illustration featured.